On Tuesday 17 October 2017, the Parish of Athboy will commemorate the 700th anniversary of the founding of the Carmelite Friary in the town. The commemoration evening will begin at 7.30pm with a celebration of Mass in St James parish church. Fr. Richard Byrne, Carmelite Provincial, will lead the celebration at which Bishop Smith with preside. Fr. Patrick O’Connor, parish priest of Athboy, will be joined by priests of the Diocese of Meath, members of the Carmelite order and people of the parish for the celebration. After Mass at 8.30pm, Fr. Simon Nolan will present a talk on “The Flourishing of Carmel in Ireland: Commemorating the 700th Anniversary of the foundation of Athboy Carmelite Friary”. Dr. Nolan is a philosopher working in the National University of Ireland (Maynooth). He has a keen interest in the medieval period having prepared his doctorate on Gerard of Bologne, who was Prior General of the Carmelite Order at the time Athboy was founded. He is also a student of the life and work of Richard FitzRalph, Archbishop of Armagh. The archbishops of Armagh were patrons of Athboy throughout the medieval and early modern period. Fr. Simon plans to offer an interesting and engaging talk that will help bring to life a truly fascinating time in the history of Athboy. The talk will take place int he wonderful new National School building lose to the parish church and will be followed by a cup of tea! Everyone is welcome. The friary at Athboy was formally established on 17th October 1317 by William de Loundres, the manorial Lord of Athboy, on foot of a license granted by Edward II. William had granted the friars a piece of land “between the outskirt (priariam) of the town and that of Henculins Mulghan” (O’Dwyer). An interesting question is, was the site inside or outside the town walls? Did the priory stand in present day Town Parks in what is now a green field site bounded to the north by St James Church (Church of Ireland) and did the line of the old walls , to the south by Danescourt, to the west by Beechgrove and east by the Athboy River? Where ever the exact location of the friary it was given by William to the Friars of the Blessed Virgin Mary of Mount Carmel (Carmelites or White Friars) and dedicated to The Blessed Virgin Mary. 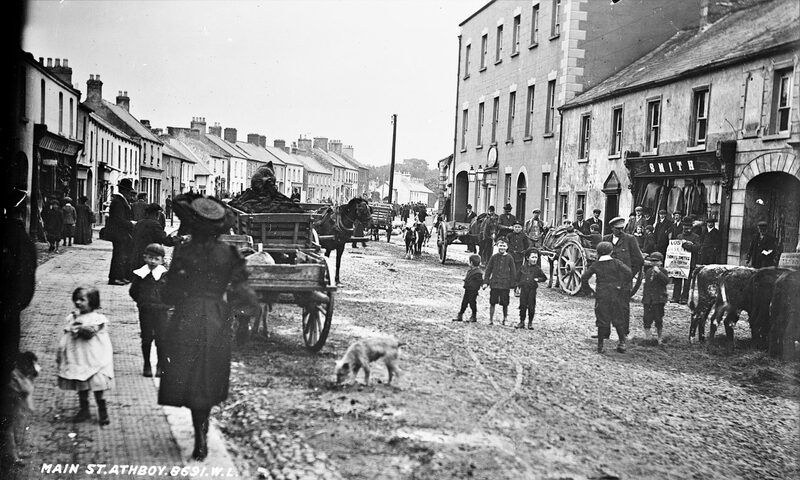 It was to serve the people of Athboy for over 200 years. What would the Athboy Chapter have looked like? The simple answer is, it’s hard to know as the priory complex no longer stands. There are a number of wonderful ruined Carmelite friaries throughout the country which can be viewed online. A fine example is at Loughrea, Co. Galway which was established in 1300, a few years before Athboy. The Athboy Friary was like a large building, large enough to host two provincial chapters of the order (1325 and 1467). It was very likely that the friary complex consisted of a large hall like church or chancel and nave, cloister, sacristy, chapter house parlor, dormitory, refectory, kitchen, library, latrine, store rooms, belfry/tower, and porters lodge. Something of the appearance of the friary and the extent of its processions can be glimpsed from the list made at the time of Dissolution in 1539. At that time the friary complex consisted of a church, belfry, cloister, stone tower, mansion (the residential building complex), a small orchard and six small gardens all within the friary complex. Apart from this the Carmelites owned eight houses in the town of Athboy, (with an additional three derelict houses), three cellars, an orchard, six gardens, four acres at Addenstown (the Friars Meadow). At the dissolution all of this went the way of Thomas Casey. He appears to have taken up residence in the mansion and improved it with stones from the dismantle cloister. The friary church seems to have fallen into disuse and Casey was able to convert the building for use as a mill. A corn mill, powered literally by horse power! Thomas Casey was a local Catholic Merchant. The friary in its day would have looked quite impressive and have stood as testimony to the prosperity of Athboy and the forward outlook of its people. What did the friars do? They provided pastoral care to the people of the area. In their church they would have celebrated Mass and made the sacrament of penance available. At the season of Lent and Advent they would have preached for the people who could come to their church to listen and be impressed to turn their lives around. They would have visited among the people and sought their support. Athboy had been a parish since the 12th century , so there were parochial clergy who ministered from St. James Parish church. We can imagine very interesting relationship between the Carmelites and the secular clergy! On at least one occasion in 1372, the friars found themselves on the wrong side of the law as the result of the purchase from local Richard de Maghery of two gardens without royal permission In 1408, the friars themselves took legal action against Richard Christopher and George Lameragh for “injuries inflicted”. The friars would have been a regular sight around the medieval town and countryside. The dissolution effectively ended the Carmelite presence at Athboy, though at least once Carmelite returned to the town for a short period in the early 17th Century. A lovely lithograph of the parish church dated to 1778 entitled “Remains of the Carmelite Church at Athboy” depicts the parish Church of the time with a tower and adjacent remains of a medieval building. Samuel Lewis in his entry for Athboy, dated around 1840 mentions the friary and states” there are some picturesque remains of the ancient church” . The early 20th century historian Rev. John Healy notes that some of the abbey churches later became parish churches and in this context mentions Athboy and St. Mary’s in Drogheda (also a Carmelite Friary) as examples. The interesting thing is that the National Librarian Collection contains two prints of St Marys, one dated 1785 and the other from 1791. Both prints depict the parish church situated with the magnificent remains of the old friary not unlike the Athboy print. Would it not be wonderful to imagine that in looking at the 1778 Athboy print that we are gazing upon the ancient friary? Finally, Athboy was one of a number of Camelite friaries in the early modern Diocese of Meath. The others included St Marys, Drogheda, the friary at Kilcormac in Co. Offaly an the friary at Ardnacrany in the parish of Dumraney. Very interesting history for me. My father was born and raised in Athboy, coming here to New Jersey with his mother when he was sixteen (1932). He stayed here, fought in WW2, married and raised me and my sister. I visit Athboy every time I am over to visit my aunt and family, but never had a clue before about the towns history. My cousin’s daughter, who lives in Australia, recently had a baby and flew back to Athboy so he could be baptized at St. James church like all our ancestors. Thank you for the reply. You didn’t give your name. Next time you are coming to Athboy let us know and we can give you a Céad Míle Fáilte.